Bob, Larry & the whole crew are taking to the stage with the silliest Silly Song Countdown ever! ?This high energy song and dance spectacular takes silliness to a whole new level! ?But sometimes silliness just isn t enough! ?Archibald Asparagus prefers songs that have lessons, Mr. Lunt only wants to sing about food, and Jimmy and Jerry Gourd are stuck in the 80s! 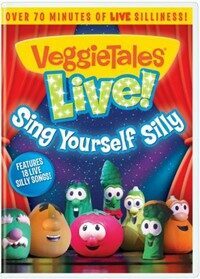 ?But there's only so much time..will the Veggies learn the importance of sharing so that the show can go on and everyone will be able to sing themselves silly? ?